Both Virat and Anushka have supported each other through thick and thin. Anushka Sharma and Virat Kohli are among the most celebrated couples in the cricketing fraternity. The lovebirds entered wedlock last year in December and their relationship has only strengthened. The popular personalities have also been supportive of each other. On many occasions when brickbats were hurled at Anushka for Virat’s poor performances, the Indian skipper always stood by her side. Recently, while the garbage incident sparked, the Delhi-born cricketer echoed her words in spreading awareness of not dumping undesired objects on the streets. The Bollywood actress has also supported Virat and whichever team he has gone on to represent. While she has been present at the stands of venues during India matches, Anushka also rooted for her husband when he played for RCB in the IPL. She is presently in England where India is currently taking part in a couple of limited-overs’ series. Anushka didn’t go to Ireland and joined Virat in Cardiff prior to the second T20I at the Sophia Gardens. Both were seen sitting beside each other inside the team bus. The Men in Blue won the T20I series with a resounding victory at the County Ground in Bristol. Following their triumph, another example of their camaraderie was spotted. In a post-match show when the likes of Kumar Sangakkara analysed the happenings of the match, Virat and Anushka were seen sharing a hug in the backdrop. The ODI series starts tomorrow at the Trent Bridge in Nottingham, the same venue where the highest total of 481 in the 50-over format was carved by England against Australia. Both celebrities have been active participants on the social media platforms and pretty frequently, they post their pictures on Twitter and Instagram. Meanwhile, people have also trolled them at times and the same took place again when Virat posted a photo on Instagram. 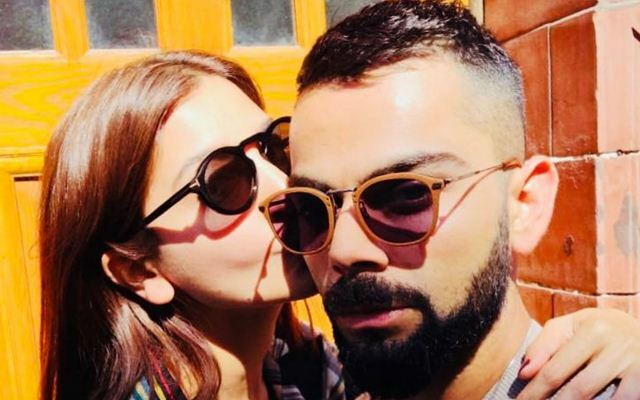 The 29-year old uploaded a picture where Anushka was seen kissing him on the cheeks. However, the netizens found Virat’s picture a tad weird owing to the batsman’s hairstyle. Subsequently, the mocked him.